We offer various styles, colors, and fabrics for your sporting league, school PE uniforms, intramural sports, softball leagues, and much more! You can mix and match to create a great looking uniform. 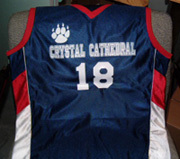 We can add team names, numbers and logos . Give me a call and I will give you the best possible quote and offer you price breaks when you order a full team of uniforms.